Oh my, these books might actually be the end of me. How could I ever move on from these characters? I’m not ready for book 4 – I’m not ready for my time with them to end. Every other character I meet after them will just… not be enough. –These characters are my babies. Like I said, I love them all so, so much and I both want to devour book 4 now and take my sweet, sweet time with it because I never want this to end. I feel like Blue Lily, Lily Blue focused more on Blue again, and also on Adam. And the character development is yet again out of this world amazing. I just want to publicly state my love for Adam. Yes, I love them all equally and it’s impossible to choose favorites, but I feel like Adam deserves some more love. – The friendships. The family. Aww man. I just want to cry because it’s all so perfect and beautiful and I want this and I don’t care if I look like a crazy person. –The romance will break my heart. Actually, there is very little romance in this book in the form of dates or kissing, but I feel like the romance is just woven into every single sentence so subtly and so beautifully. It’s over the entire book without you even noticing except for this warm feeling on your heart. Also, so MANY Pynch scenes! That said, I’m shallow and I do hope we get some actual romance and kissing in book 4. Except for, you know, doomed kisses that will actually kill someone. So not looking forward to that heartache. –I loved meeting the new characters. The Greenmantles were such fun and original villains and I was never really sure whether to find them hilarious or scary. And Jesse Dittley was just such a sweetheart that I couldn’t help but fall in love with him as well. 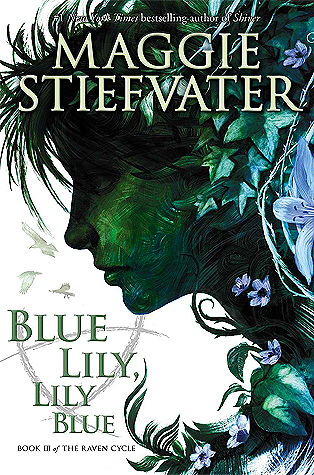 Overall, Blue Lily, Lily Blue was just an amazing continuation of The Dream Thieves. I read them back to back, so in my mind they kind of feel like one book though. Both are equally amazing. I love the plot, I love the atmosphere, I love the pacing. But more than all that, I just love these characters and their friendship most of all. “I know when I’m awake and when I’m asleep,” Ronan Lynch said. “Maybe I dreamt you,” he said. “Adam finally sat down on one of the pews. Laying his cheek against the smooth back of it, he looked at Ronan. Strangely enough, Ronan belonged here, too, just as he had at the Barns. This noisy, lush religion had created him just as much as his father’s world of dreams; it seemed impossible for all of Ronan to exist in one person. Adam was beginning to realize that he hadn’t known Ronan at all. Or rather, he had known part of him and assumed it was all of him. Have you read Blue Lily, Lily Blue? What did you think about it?